Artifacts are near-impossible to permanently destroy, and usually resurface in several years, a notable exception being Fearstruck. Most artifacts possess powerful enchantments, superior craftsmanship, or both. Artifacts come in many forms, including weapons, armor, rings, books, and mundane items. They often go by several names, and are well-known to the people of Tamriel. Daedric artifacts are predominately made of ebony. 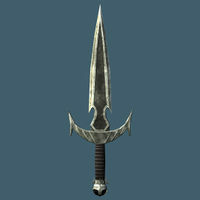 Doom-driven heroes are known to come into contact with many artifacts, and the prophecies of the Elder Scrolls sometimes relate to a specific artifact. This page was last modified on 16 March 2019, at 11:38.